Well, planed to stay two nights, stayed seven. Djiana and her staff make you feel like hanging out at friends. Good facilities, nice kitchen, terrace, friendly dog (cheers Don!). Perfect place to relax after you explored Ulcinj and it's surroundings. When you get there take the boat trip they offer! Had the best time there! This hostel is awesome! It felt like home and there is so much to do around. Just ask the host, she'll tell you about everything or try to beat you by a game of cards. One of the best hostels I've ever stayed in. Very clean, perfect atmosphere, top location and a lovely host. Loved it! I enjoyed my stay at Pirate hostel, but I'm not as excited as some others reviewers. Mainly I think it's because I didn't like Ulcinj too much. The beach is a bit far and very crowded. There is a nice walk through a pine forest to another beach, which is much nicer. Unfortunately the boat trip was full when I was at the hostel so I couldn't join. I forgot my phone charger at the hostel at Diana was so sweet to give it to girl who travelled after me to Shkoder. Thank you so much for that! Sehr schönes Hostel zentral in Ulcinj gelegen. Der Staff war sehr freundlich und Hilfsbereit. Es gibt jeden Abend um 9Uhr Freibier, dort kommt man gut mit anderen in Kontakt. Ich empfehle das Hostel für jmd. der gerne neue Leute kennenlernt und auch gerne mal ein bisschen feiern geht. Abends ab elf ist es ruhig im Hostel, man wird also nicht um seinen Schlaf gebracht. 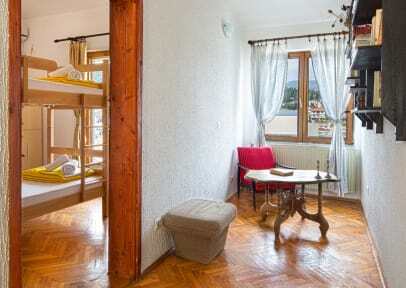 This hostel is definetly a good one and we can recommend it. Its location is a little bit off site. The staff and especially the owner Diana are very nice and friendly and help to organise activities. Unfortunately the boat trip offered by the hostel was cancelled two times during our stay so we could not take it. The atmosphere there is very familiar, people seem to stay usually longer than one or two nights. Our room was directly at the terrace where everyone hangs out and thereby a bit noisy. Could be a cleaner in the bathrooms.